Happy St. Patrick’s Day to all of the leprechauns of the blog from the Turley Clan. It is a beautiful St. Patty’s Day in McLean, Virginia and the leprechauns came to bring treats and tricks to the Turley house this morning. Madie made an elaborate leprechaun house with entertainment and even beer. The leprechaun loved it and left three-leaf clovers for a treasure hunt. The treasure proved to be a basket of holiday cookies and cupcakes. They left our traditional dollar coins hanging from a tree in green felt pouches for each of the kids in the backyard. Tonight we will be feasting on corned beef and cabbage and toasting my late Irish father, Jack Turley. Best wishes to the Turley clan in Ireland, particularly in the counties Armaugh and Down. We are thinking of visiting Ireland this summer so we may soon be able to visit the little Leprechaun darlings on their home turf! And to everyone . . . Erin go Bragh!!! Steve, I love to learn about family history. Thanks for sharing it. A happy St. Patrick’s Day to all. My great-grandmother, Annie Lynch, born in County Armagh in Northern Ireland, married Gustav Groen from Amsterdam and settled in the San Francisco-Bay Area. I’m half Irish and can be tough on that clan. But, today is for celebrating the goodness in the Irish. I prefer an Irish lamb stew to corned beef. My grandma made a wonderful soda bread that was simple and delicious. Happy St. Patrick’s Day to you, JT. …A bit of Irish humor….Irish author Brendan Behan was near death, attended by a nun who was his nurse. His final words are said to be ” Bless you, Sister. May all your sons be bishops”. Erin should go bra less. I didn’t know that the leprechauns brought treats. They never came to our house. Or maybe they did, but my father was drunk and shot them…? 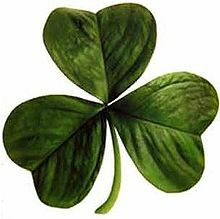 Anyway, happy St. Padraig’s Day to all (“Padraig” is the Irish-language pronunciation of the English-language “Patrick.” Irish people call their sons “Paddy” as a deriviate of Padraig, which is where the term “Paddy Wagon” comes from. Some say Paddy Wagon is an ethnic slur, a reference to all the immigrant Paddys being hauled off to the drunk tank. Others say the term came from the Irish Draft Riots in New York, when the immigrant Irish rebelled against being conscripted off the ships to go fight and die for the Union Army in the Civil War. The immigrants weren’t happy being used as cannon fodder in a war that had nothing to do with them. Good on ya, Jonathan. I be Celtic myself, courtesy of my Huggard paterfamilias. And to you as well, Counselor! And when the time comes, may you be in heaven an hour before the Devil knows you’re dead.